Top engineer Brendan McReynolds knows that the fastest way to get great vocal results is to reach for Revoice Pro. Here he tells the story of getting a vocal sung by a non-native English speaker perfectly locked to the guide track, laid-down by recording legend, Stevie Wonder. 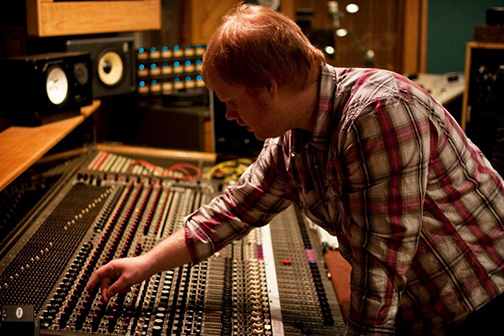 He has been an active recording engineer and producer since 2008, working with top acts such as Justin Bieber, Los Lobos, HBO's Trueblood and numerous other musicians in Nashville's premier recording studios and in his native Kansas City. While he uses Pro Tools extensively, Brendan's preferred medium of recording is analogue tape. In the fall of 2013 he moved to Los Angeles and is currently working with producer, Onrée Gill (Will.I.Am., Britney Spears, Alicia Keys). "My relationship with Synchro Arts began fairly soon after I started working at my first big studio in Kansas City. It was my first time really engineering anything for anyone and I was learning everything I could. During a session for my own band, my friend pulled up this plug-in that changed the game for me. It was VocALign. Since then, I’ve moved up to Revoice Pro, and every day it makes my world a little easier to work in. In every job that has a vocal session, I’ve incorporated these tools into my workflow. Most recently I had to edit vocals on a track that was written by Stevie Wonder. But the vocalist the song was written for was not a native English speaker and, however good a singer he was, he just couldn’t perform the timing the same as Stevie’s guide vocals. Synchro Arts really help me do the job day after day, and for that I'm really grateful."